So, it’s the yearly arrival of one of the most anticipated beer drinking holidays every year. In addition to Cinco de Mayo, Mardi Gras, Easter, Daylight Savings, Winter Solstice, Groundhog Day, my birthday, my wife’s birthday, Presidents Day, Flag Day, Martin Luther King Day, Memorial Day, Labor Day, 4th of July, Thanksgiving, Christmas Eve, Christmas and New Year’s Eve, St. Patty’s Day is special. As in many years past, typical St. Paddy’s Day fun would mean going to an Irish bar, ordering some green concoction of the crappiest beer they had but told you it was Guinness, and pounding enough to make your teeth green enough to make it look like you borrowed them from Shrek’s mouth. You’d spend half the next day in the lou singing like the Irish Tenors, wishing you had eaten less cabbage and corned beef, and can’t get enough Pedialyte even if you were married to the Abbott rep. Man, I loved those days…anyway, I’m taking better care of myself now and sticking to the bottled stuff this year. After powering down a bowl of Lucky Charms (heck, they're magically delicious! ), I made a trip to my Total Wine megastore. ‘’Oh, but Marty, that’s not draft beer”…see above. Anyway, These Irish Eyes Were Smilin when I spied the full aisle dedicated to our U.K. brethren. Seeing as how I am greatly familiar with the islands most popular offering, Guinness Stout, I decided to use this space to step out of the proverbial box and try something new to share with you. Seizing upon a 12 pack of what these Irish consider ‘craft’ beer’, I had to pop the Cork and go for it. 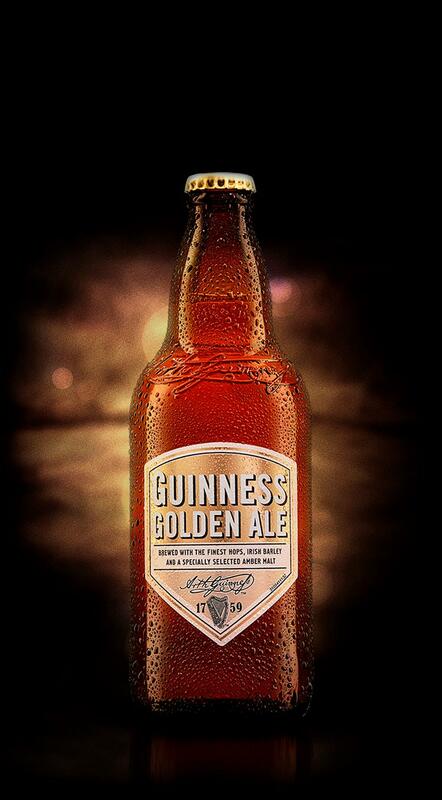 Because Guinness has been brewing ale since 1759, they claim to have a crapload of recipes that have never hit the shelves and they decided to take advantage of the craft sensation and start their own version. The initiative, called the "Brewers Project," is based in a small brewery within Guinness's main operations at St. James's Gate in Dublin, Ireland. There, a team of brewers is experimenting with new beers, dusting off old Guinness recipes for inspiration while drawing upon present-day beer trends. "We see the need here to really drive our innovation agenda," Ms. Giles said. "We know that millennials are looking for variety”, according to AdAge. Funny, I thought the only variety millennials were looking for was in either Spring Meadow or Forest Rain Tide Pods. Irish wheat-Would offer Guinness’ take and history on this bug juice but I can’t find anything on it (even on their website and Brewers Project). Looking closely, the label says it is produced at Brewers Gate like the others. ‘Refreshing taste, full-bodied wheat beer. Zesty citrus, subtle clove and banana notes’. Wow. Shocked to like it but it’s just the first one, right? Believe it or not, the 4th is just as good! Very smooth with a little bite. Tad citrus, very drinkable. Typical wheat taste but not a flat taste which is the reason I typically don't opt for this style of brau. Still can’t believe I like a wheat beer…Would definitely drink again, especially as I notice the 5.3% ABV. Would go well while sitting on a porch in the summer eating pimento sandwich squares. But that’s not my style. 7.5! Bam! Usually, I never look at the description before I consume the suds. This time, I glanced at it and I believe it led me down the yellow malt road. My mouth confirmed this as the label describes an amber malt. Possessing a clean, ale taste but most definitely an amber influence. Very drinkable, almost a champagne of Beers cleanliness (cannot believe I even said that) without the squirts. So far, my favorite but then notice I wasn’t buzzing after 3 of them. Hmmm. Oh yeah, it’s a 4.5% ABV. If you’re thinking about hitting the links, put a 6 of these in your bag. You’ll think you’re at Carnoustie. Play like you’re at a muni. Give it a 6.5. Now, my story. Full-bodied, very malty flavor. The description says there are floral and citrus notes-not sensing it with this keen proboscis or throat. Still a tad skunky on the nostrus, I still taste malt in this lager! ABV of 5% but still drinkable, especially for breakfast. Give it a 6.5. Disappointing in the fact that I thought it would be one my favorites. Ever kissed a blarney stone? This is it. Well, the heavy hitter is here. Can’t wait to get my lips around this (easy…). Thinking this will be the run-away winner, I took the obligatory, "I'm gonna really enjoy this" quaff. Smooth at first but I'm noticing an amber finish. Damn. I'm starting to think that Amber is not my thing. At first taste, I can understand why they give it away. I can really appreciate the rye malt but do not even get a hint of the grapefruit the brewmasters say they spiked in this offering although the pale ale hops they poured in here dictate that flavor. I finish it begrudgingly as I sit here thinking that Guinness may have overextended with these new recipes. Maybe I should have just had 1 of each. Maybe I shouldn't have eaten the Sweet and Spicy Doritos beforehand. Maybe I'm just not enough Irish to appreciate this hop juice’s flavor history...Nah, I'm a beer Guy. As long as you don't bring Coors Light, Michelob Ultra or Yuengling to the party, I'm good. At 5% ABV, it’s still one of the best of the bunch. That best gets it a 7. Hope this experiment helped you decide on your holiday hop this year. Enjoy St. Patrick’s Day, my friends. Drink Responsibly and stay away from the Pods!